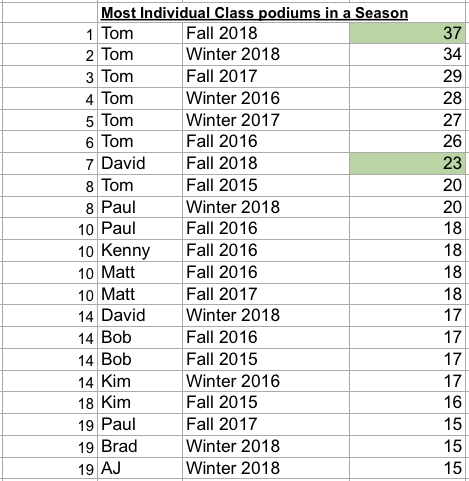 Strange it won't let me edit my original post....David joins the likes of Badger, Kimchi, B-rad, Pauly Walnuts, Fozzy Bear and Triple T as season podiumies. Congrats on a hard earned sit! Danke schoen, Tom. Wasn't there also an Australian "who shall not be mentioned." Oh right, that's why you left him out. Last edited by AndGoliath; 11-26-2018, 06:10 PM. Ah yes, how could I forget AJ! 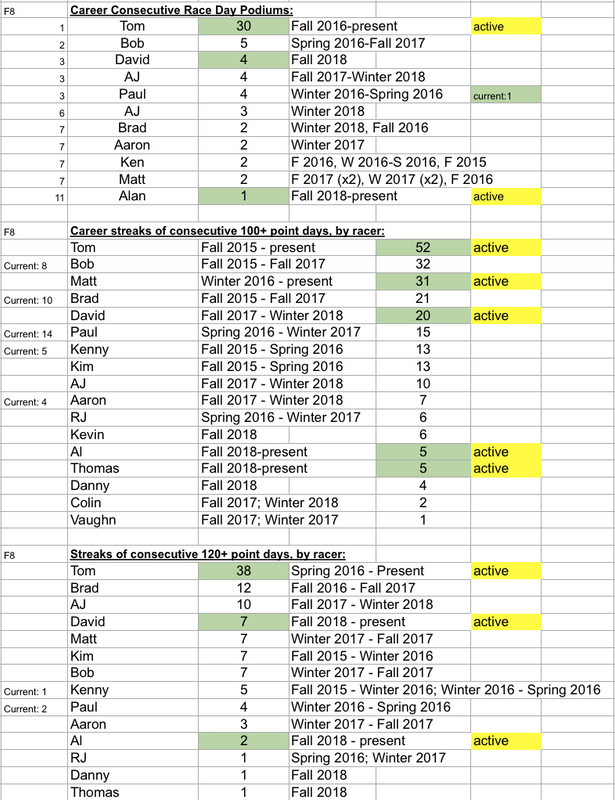 I added the calculated IOEs for the season so far to post 28 (http://slotcarillustrated.com/portal...5&postcount=28). The IOE will be used as the first tiebreaker. These values are preliminary. The final values will be calculated after the last race. Alan needs 90 to reach 3500. Thomas needs 12 to tie his previous 560 (Winter 2018). Brad has not scored below 120. Paul, Matt. and Kevin have not scored below 100. Paul reached 20 all-time this season. Aaron reached 15 all-time this season. Ken and Brad need one more podium to reach 15 all-time. Ken, Brad, and Aaron each need one podium this season to break the tie for third (2 podiums a piece). Thomas with 3 has set a personal best. Last edited by AndGoliath; 12-06-2018, 12:11 PM. The tie for sixth between Bob and Kenny is broken in favour of Bob due to a higher normalized season IOE (80.6% versus 77.7%). See next post for IOE stats. Further stats updates will be done tomorrow. Good night. Last edited by AndGoliath; 12-10-2018, 07:02 AM. 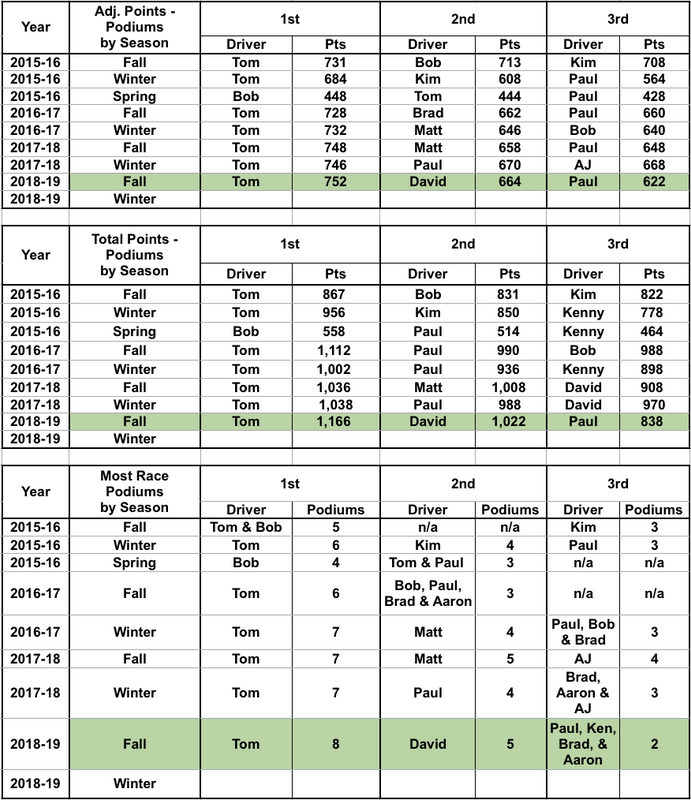 The following chart shows the season IOE calculated for the races up to and including the race indicated in the column header. The last Aldorado value is the season IOE and is the one used for breaking ties for the Fall season. Last edited by AndGoliath; 12-10-2018, 02:54 PM. Here is a wrap-up of the various milestones reached by club members this year. Current values are in brackets. 50: Ken (54), Paul (52), and Tom (52). 4000: Kevin (4432), Brad (4034), and David (4590). 5000: Aaron (5258) and Bob (5233). 6000: Paul (6364) and Ken (6188). 1st: Danny (6) and Thomas (4). 70: Brad (73) and Aaron (71). Last edited by AndGoliath; 12-10-2018, 03:06 PM. The following image contains the podiums for the classes we ran this fall. It is being provided instead of the usual series of tables and graphs. One indicator of the strength of your cars is the number of podiums it achieves. If I have time, I will generate more information, but this will have to do for now. Last edited by AndGoliath; 12-10-2018, 04:41 PM. Last edited by AndGoliath; 12-10-2018, 04:32 PM. The standings are currently dominated by those missing the least races. 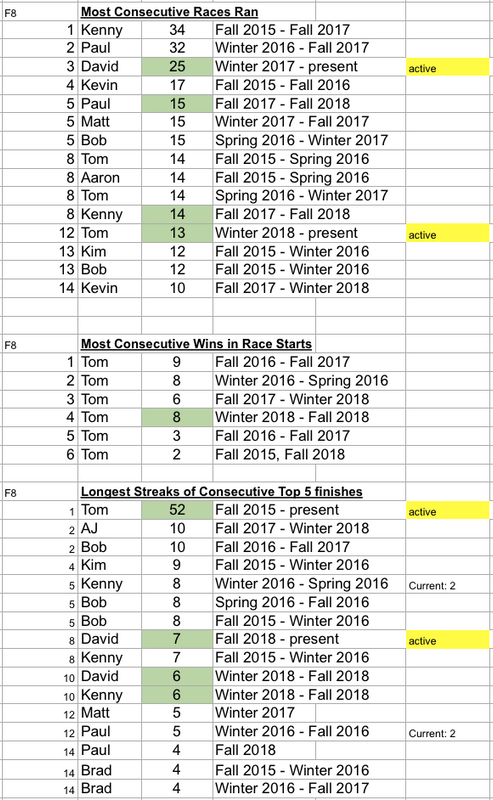 Three races into the Winter season will show a more balanced picture once the majority of the club has a complete set of ten race scores to count. Congratulations, Alan, on your current fourth place. The score you need to reach a place is the green or yellow value at the intersection of your row and the column for the place you would like to get PLUS the improvement the person in that place makes over their blue-highlighted score. A couple of people still have zero scores so that target score can significantly change. Tom and David were locked in. Paul needed a 120 to tie Aaron who did not attend. Paul got a 128 so he took third place. Alan needed a 122 to tie Bob who did not attend. Alan got a 128 so took fifth place. He was two short of tying Aaron. Ken needed a 110 to tie Allan, but Allan improved his score by 16 (128 - 112) and so the target was actually 126 (110 + 16). Ken got a 120 so it was not enough to pass Alan, but it was enough to tie Bob. Bob broke the tie by having a higher IOE so he kept sixth place. Kevin needed a 134 to tie Ken, but Ken improved his score by 16 (120 - 104) and so the target was actually 150. Kevin did not reach that. Thomas needed a 102 to tie Kevin who did not improve his score. Thomas got a 114 to take eighth. Danny needed a 90 to tie Thomas, but Thomas improved his score by 14 (114 - 100) and so the target was actually 104 (90 + 14). Danny got a 90 which was not enough to move up. Brad needed a 74 to tie Danny, but Danny was dropping a 0 score score so his whole 90 counted meaning Brad would have needed a 164 to tie. Not possible. Here are the potential milestones to be reached in the winter season. Current values are in parentheses. I have not included race day podiums or wins as they are more variable. Last edited by AndGoliath; 12-29-2018, 08:01 PM. The explanation of average IOE calculation is in previous posts (http://slotcarillustrated.com/portal...83&postcount=2 and http://slotcarillustrated.com/portal...48&postcount=8) and is not repeated here. The green-shaded values are the normalized ones we are using for determining the order.